No other product on the market gives you more coverage or greater effectiveness! Oxidizes odors, fungi, mold and other parasites, and toxic chemical gases. Destroys microorganisms like bacteria and viruses. Warranted against defects in material and workmanship. Airwise uses photo catalysis, a purification process so effective it’s FDA approved for poultry processing (destroys salmonella), pork processing (destroys E. coli), and is also widely used to remove pesticides from fruits and vegetables. It not only kills bacterial cells, but also decomposes the cell itself. It has been tested in both medical and industrial settings, and has proven successful at eliminating odors and impurities caused by chemicals, viruses, and bacteria. 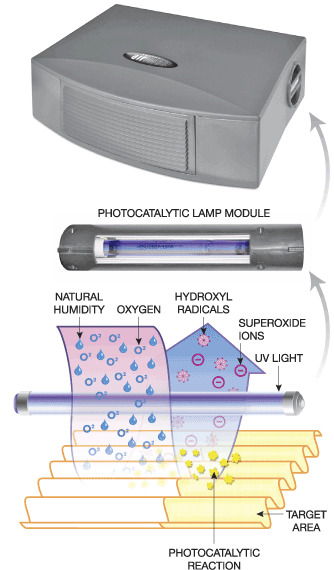 Photo catalysis is equally effective for purifying the air in your home and workplace. Use it where people typically gather to help prevent the spread of colds, flu and other illnesses. This innovative air treatment technology is designed for continuous use so that you are guaranteed pollutant-free air. So, why settle for stick (grid) units or noisy fan machines? Air that is not circulated through those units is never purified! Airwise needs no fan, so it's totally silent. And it has no grid or filter, so it requires no cleaning or filters replacement. Lamp Module replacement is required after approximately 9,000 hours (1 year) of use. No Tools are required.